Home of the University of Miami Hurricanes for more than 60 years, the Orange Bowl was the site of many historical football moments. In the early 1930s, a new stadium was needed for the University of Miami’s football program. In July 1936, the Hurricanes and the City of Miami reached an agreement to build a new stadium for the team. The stadium was completed one year later at a cost of $340,000. The stadium was originally known as Burdine Stadium and had a seating capacity of 23,330. 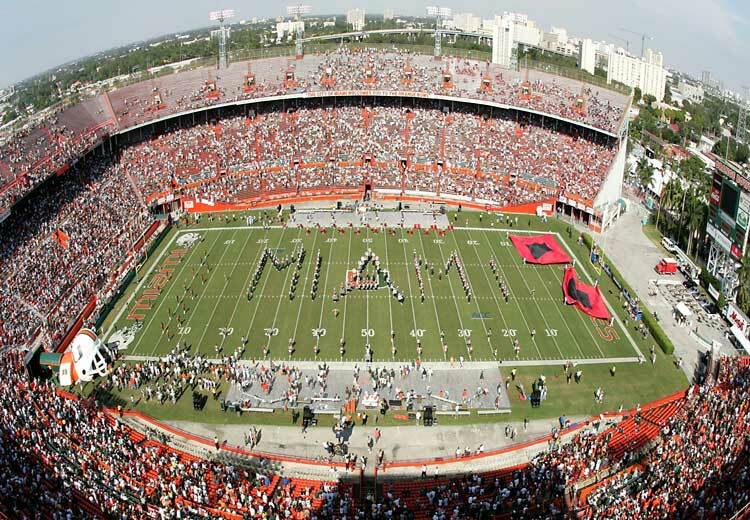 The Miami Hurricanes played their inaugural first game at the stadium on December 10, 1937 against Georgia. Like many stadiums throughout the country, the Hurricanes were a huge draw and therefore more seats were needed. In 1944, the stadium was enclosed when over 10,000 seats were added to the endzones bringing the capacity to 35,030. In 1947, an additional 25,000 seats were added raising the capacity to 60,000. Between 1950 and 1957 roughly 16,000 seats were installed completing the upper deck of the stadium. In 1959, Burdine Stadium was renamed the Orange Bowl. The NFL’s Miami Dolphins played their first game at the stadium on September 2, 1966. The east end zone seats were removed in 1977, reducing the capacity to 75,500. By the 1980s the Dolphins decided they wanted a stadium of their own. After the 1986 season they moved into Pro Player Stadium. Expansion of the VIP seating at the Orange Bowl and the addition of contour seats in the early 1990s reduced the capacity to 74,712. In 1994, construction designed to improve handicap seating further reduced the capacity. Renovations in 1996 to accommodate Olympic soccer again reduced the capacity to 72,319. Two levels of seats were in a horseshoe around the playing field. The stadium was open on one end where the score/video board is located. It was the home to many memorable football games including five Super Bowl’s and eleven National Championship football games. It was the home of the Miami Hurricanes until 2008 when they moved to Sun Life Stadium (now known as Hard Rock Stadium). 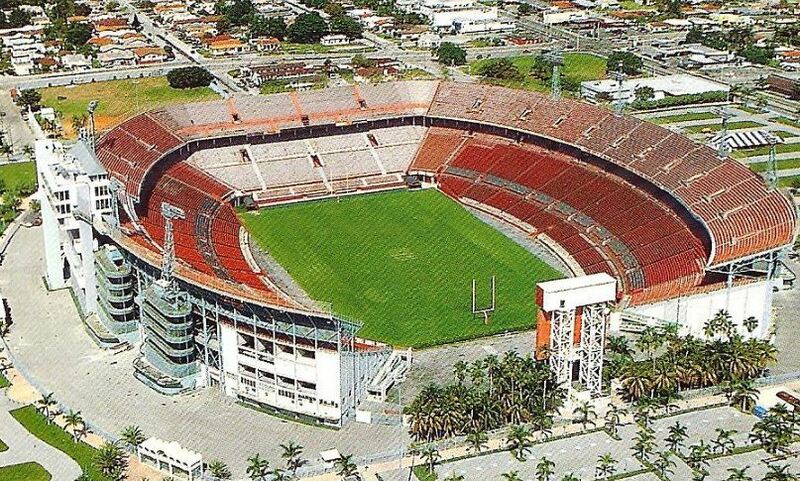 The Orange Bowl was demolished in 2008 and is now the site of Marlins Park, home of the Miami Marlins (MLB).